Naples Heritage Homes: Outstanding single family home in prestigious Naples Heritage Golf and Country Club. A premier bundled golf community - equity membership. Large premium lot on private, quite cul-de-sac with preserve views. Expanded Manchester model approximately 2825 sq. ft. under air. 3 bedrooms plus den with Murphey bed, 3.5 baths, living room, dining room, kitchen/great room, laundry room and 2 car garage. Newly remodeled kitchen with all new stainless appliance and granite counter tops. Newly remodeled 3 baths with quartz and granite. Large lanai with completely remodeled pool, travertine deck, outdoor kitchen and newer pool heater with southern, eastern and western exposure. Newer air conditioner and hot water heater. Electric hurricane shutters front and back. Manual accordion shutters on sides. Security system. New roof 2019. Cypress Pointe Naples Heritage Homes: Bundled Golf! Presenting for your consideration, an immaculate, fine Pool home nestled in the peace and quiet that only Naples Heritage Golf and Country Club offers. Over-sized corner lot and surrounded by neatly maintained landscape this gorgeous home offers the lifestyle Naples is known for. The three car garage with plenty storage affords you added space and convenience and the laundry facilities are inside the home. Relax by the L shaped totally screened and caged pool and spa with Keystone deck or use one of three additional pools located near the state of the art clubhouse. Play at the superbly maintained golf course designed by Gordon Lewis with every golfer in mind. Play tennis or pickle ball in any of the 4 courts and dine at the fine restaurant to cap off your day. This community is highly active with many social activities and events. Private bundled golf and security manned gates makes for a lifestyle sure to add many years of enjoyment. Schedule your viewing appointment fast. Brand new roof will be installed in March 2019. Internet and cable included in HOA Sellers disclosure is available. Cypress Pointe Naples Heritage Homes: Naples Heritage Golf and Country Club is Naples best kept secret for its abundance of natural beauty and value within its uniquely friendly community! Enjoy playing golf on an 18 hole course surrounded by pristine landscaping! This stunning home has it all, a spacious open floor plan, with a contemporary flair and clean freshly painted wall colors and trim. Crown molding, wainscoting and attention to detail in this immaculate home! Move in ready with many quality improvements and upgrades...plantation shutters, new interior paint, kitchen cabinets and appliances, newer central air and water water heater, washer and dryer - along with newer pool equipment as well as a newly screened pool cage. Furnished with a few exceptions. The den/fourth bedroom has real wood flooring and a full bathroom accessible from the pool - perfect when entertaining guests by the pool. Located on the fifth tee. Close to downtown Naples with its shopping, restaurants and beautiful beaches. This home has it all! Naples Heritage with great golf, dining, fitness center, tennis, pickle ball, pools this community has it all! Seller financing would be considered for a purchase with down payment. Cypress Pointe Naples Heritage Homes: WHAT A MAGNIFICENT HOME & THE PERFECT PLACE TO ENTERTAIN! CANTERBURY III FLOOR PLAN ABSOLUTELY BEAUTIFUL VIEW OF PRESERVE OVER THE WATER WITH WESTERN EXPOSURE TO ENJOY NIGHTLY SUNSETS EXTRA LARGE POOL AREA WATER FALL AND EXPANDED OUT DOOR AREA WITH LARGE TV & SITTING AREA OPEN THE SLIDERS AND LET THE BREEZE FLOW THROUGH FRONT TO BACK. THE KITCHEN WAS UPDATED 4 YEARS AGO- NEW CABINETS GRANITE BACK SPLASH & GE PROFILE STAINLESS APPLIANCES NEW TILE ON THE DIAGONAL IN ALL AREAS EXCEPT THE 3 BEDROOMS WHICH HAVE BAMBOO FLOORING . WALK OUT SLIDER FROM MASTER BEDROOM TO POOL. AMPLE STORAGE IN THE 2 PANTRIES IN THE KITCHEN AREA. BOTH THE MASTER AND GUEST BATHS HAVE BEEN COMPLETELY UPDATED WITH BEAUTIFUL TILE. CUSTOM HUNTER DOUGLAS SOFT SHADES THROUGH OUT MOST OF THE HOUSE. ACCORDION STYLE HURRICANE SHUTTERS AROUND THE BACK PERIMETER OF THE PROPERTY FOR ULTIMATE IN PRIVACY & SECURITY - 15 YEAR WARRANTY. NEW A/C, ROOF & HOT WATER HEATER. NEWER BOSCHE AXXIS WASHER AND DRYER. THE GARAGE IS EPOXIED GREY WITH WHITE & GREY SPECKLED FLAKE. EXTRA SINK ADDED IN GARAGE AREA. MOST OF THE FURNISHINGS IS STAYING MINUS PERSONAL ITEMS THIS IS NAPLES HERITAGE LIFE STYLE AT IT'S BEST!! Cypress Pointe Naples Heritage Homes: PRICE ADJUSTMENT Spectacular, spotless waterfront home with lake views and awesome sunsets from the extended lanai with pool, pool bath and spa. This 3-bedroom, 3-bath home features an Island Kitchen with open concept family room and dining area. Split bedroom layout, master with large full bath and separate shower, spacious closets and direct access to the lanai. Electric and manual shutters all-around with alarmed security system make it easy to button up this home without moving lots of furniture. 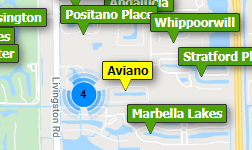 Convenient to the finest that Naples and Marco Island have to offer in shopping, beaches and fine dining. Move in turnkey ready with many quality improvements and upgrades-new tile roof and washer (2018) and central air (2015) - along with newer pool equipment and newly screened pool cage. In prestigious gated Naples Heritage Golf and Country Club with incredible golf course, tennis club, fitness center, pickle-ball courts and much more. Enjoy playing Naples Heritage Golf and Country Club, a Gordon Lewis course with its abundance of natural beauty and value within its uniquely friendly community! Redesigned in 2015 over 550 acres, 350 pristine preserves and nicely manicured. Villas At Kilkenny Naples Heritage Homes: V.2854 New listing! Sought-after Dover floorplan featuring an open layout with 2 bedrooms + den (which could be used as a third bedroom) and two full baths. Beautiful outdoor living space with expansive pool. New roof 2018. Naples Heritage is a bundled golf community featuring gated entry, 18-hole golf course, pro-shop, renovated clubhouse, dining, social events, four heated swimming pools and spa, fitness facility, tennis, bocce & pickleball courts and more! Need professional assistance selling your property at Naples Heritage Naples? Find out how an Area Specialist can help to generate more property exposure in order to get the most money for your investment in the least amount of time.